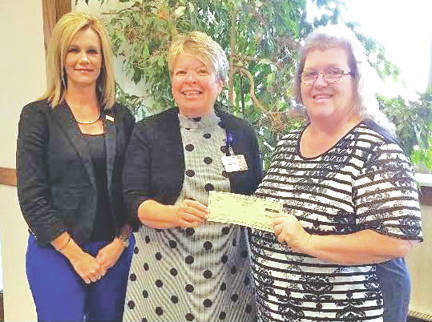 Merchants National Bank recently made an annual pledge payment to the Highland District Hospital Foundation GreatER Care Campaign. The campaign, which began in 2016 and will continue until 2020, is an effort to raise more than $1.5 million toward the renovation and expansion of the emergency department at the hospital. Because of generous donations, pledges and support, the foundation has reached $1,351,597 toward that goal. For more information on the GreatER Care Campaign, call Cathy Jones at 937-393-6360. Pictured, from left, are Denise Fauber, MNB vice president of branch operations; Cathy Jones, HDH Foundation director; and Bertha Hamilton, MNB chairman secretary/HR. https://www.timesgazette.com/wp-content/uploads/sites/33/2018/07/web1_Hospital-pic.jpgMerchants National Bank recently made an annual pledge payment to the Highland District Hospital Foundation GreatER Care Campaign. The campaign, which began in 2016 and will continue until 2020, is an effort to raise more than $1.5 million toward the renovation and expansion of the emergency department at the hospital. Because of generous donations, pledges and support, the foundation has reached $1,351,597 toward that goal. For more information on the GreatER Care Campaign, call Cathy Jones at 937-393-6360. Pictured, from left, are Denise Fauber, MNB vice president of branch operations; Cathy Jones, HDH Foundation director; and Bertha Hamilton, MNB chairman secretary/HR.